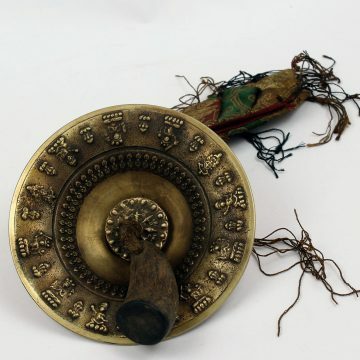 Shang Bells also calls Zhang(chyang) in Tibet, is a Tibetan ritual upturned flat hand bell employed by Bonpos and Shamans. Shang bells cam find 3 to 10 inches diameters. Shang bells are believed to originate from Zhangzhung or Shangshung( ancient city of Tibet). They are symbolically similar to Drilbu or Ghanta(Bells).